Federal law, federal law enforcement. Utah Congressman Chris Stewart managed to dance around a pretty good point the other day, though never actually hitting his target, when he said that federal regulatory agencies such as the Bureau of Land Management should not have paramilitary SWAT teams enforcing the law, their rules and court orders. For one thing, the BLM does not have a SWAT team. It does  like many other federal, state and local agencies, from the Secret Service to the Utah Transit Authority  have its owned armed constabulary to keep the peace and enforce the rules. But a paramilitary strike force? Hardly. For another, it would be more accurate to say that the BLM, and similar agencies, should not need a SWAT team. And, were Stewart and other Utah politicians not out there lending aid and comfort to some seriously deluded folks who recognize neither the existence of the federal government nor its authority over the public lands to which that government holds clear title, the need for any armed action on the part of federal agencies would be much reduced. 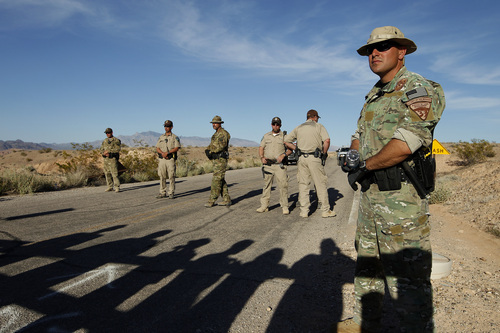 This all matters because a horribly violent turn of events was narrowly avoided recently when a group of heavily armed pseudo-patriots massed around nationally famous scofflaw Cliven Bundy as the BLM was preparing to seize some of the cattle that Nevada rancher has been illegally running on federal land for two decades or more. The BLM clearly had the law on its side. But its administrators were correct to pull back, free the cows and avoid a bloody confrontation that would have transformed Bundy and his friends from desert dunderheads to tea party martyrs. The agency says it will now do what it should have done all along, and seek less confrontational remedies. Like, perhaps, seizing a few federally insured bank accounts. Stewart&apos;s other point  that such legal disputes should only be settled with the aid of local law enforcement  may be one of the worst ideas in the history of bad ideas. Federal law on federal land should be enforced by federal agencies, answerable to Congress. If having dozens of armed law enforcement branches makes it too convenient for middle-level bureaucrats to call out the firepower, then such matters can be the job of the FBI or the U.S. Marshal. If a Nevada county sheriff does have the muscle needed for such a mission, it is probably because it is one of the many local agencies that has been frighteningly militarized with federal money and federal hand-me-downs as part of the misbegotten war on drugs or in search of illegal immigrants. The feds should enforce the law carefully. More carefully than they did here. But they should enforce the law.